Why is it that our current twenty-first century A.D. is so similar to the twenty-first century B.C.? Is history destined to repeat itself? Will biblical prophecies come true, and if so, when? It has been more than three decades since Zecharia Sitchin's trailblazing book The 12th Planet brought to life the Sumerian civilization and its record of the Anunnaki--the extraterrestrials who fashioned man and gave mankind civilization and religion. 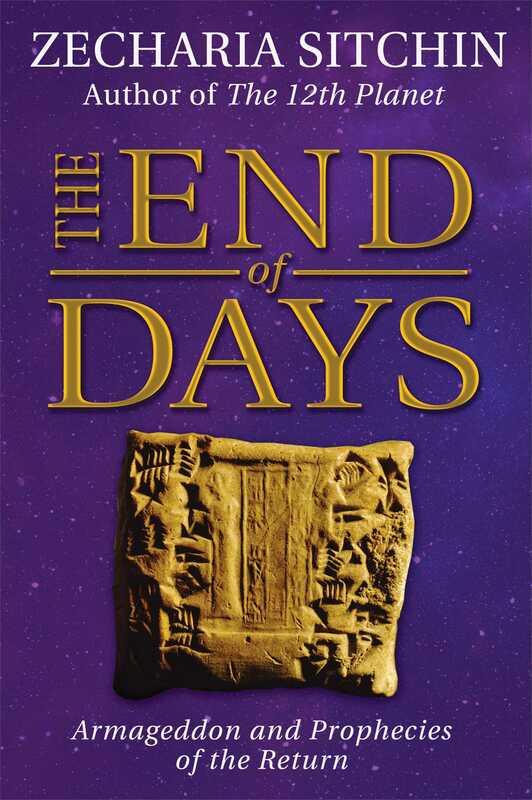 In this final volume of the Earth Chronicles Series, Sitchin shows that the End is anchored in the events of the Beginning, and once you learn of this Beginning, it is possible to foretell the Future. In The End of Days, a masterwork that required thirty years of additional research, Sitchin presents compelling new evidence that the Past is the Future--that mankind and its planet Earth are subject to a predetermined cyclical Celestial Time. What were those religious wars about? The wars, and national gods in whose name they were fought, don’t make sense except when one realizes that at the core of the conflicts was what the Sumerians called DUR.AN.KI--the “Bond Heaven-Earth.” Repeatedly, the ancient texts spoke of the catastrophe “when Earth was separated from Heaven”--when the spaceport connecting them was destroyed. The overwhelming question in the aftermath of the nuclear calamity was this: Who--which god and his nation--could claim to be the one on Earth who now possessed the link to the Heavens? For the gods, the destruction of the spaceport in the Sinai Peninsula was a material loss of a facility that required replacement. But can one imagine the the spiritual and religious impact--on Mankind? All of a sudden, the worshipped gods of Heaven and Earth were cut off from Heaven . . .
With the spaceport in the Sinai now obliterated, only three space-related sites remained in the Old World: the Landing Place in the Cedar Mountains; the post-Diluvial Mission Control Center that replaced Nippur; and the Great Pyramids in Egypt that anchored the Landing Corridor. With the destruction of the spaceport, did those other sites still have a useful celestial function--and thus a religious significance? We know the answer, to some extent, because all three sites still stand on Earth, challenging mankind by their mysteries and the gods by facing upward to the heavens. The most familiar is the Great Pyramid and its companions in Giza; its size, geometric precision, inner complexity, and celestial alignments have long cast doubt on the attribution of its construction to a Pharaoh named Cheops--an attribution supported solely by a discovery of a hieroglyph of his name inside the pyramid. In other books I have offered textual and pictorial evidence explaining how and why the Anunnaki designed and built those pyramids. Having been stripped of its radiating guidance equipment during the wars of the gods, the Great Pyramid and its companions continued to serve as physical beacons for the Landing Corridor. With the spaceport gone, they remained silent witnesses to a vanished Past; there has been no indication they ever became sacred religious objects. The Landing Place in the Cedar Forest has a different record. Gilgamesh, who went to it almost a millennium before the nuclear calamity, witnessed there the launching of a rocket ship; and the Phoenicians of the nearby city of Byblos on the Mediterranean coast depicted on a coin a rocket ship emplaced on a special base within an enclosure at the very same place--almost a thousand years after the nuclear event. So, with and then without the spaceport, the Landing Place continued to be operative. The place, Ba’albek (“The valley-cleft of Ba’al”), in Lebanon, consisted in antiquity of a vast (about five million square feet) platform of paved stones at the northwestern corner of which an enormous stone structure rose heavenward. Built with perfectly shaped massive stone blocks weighing 600 to 900 tons each, its western wall was especially fortified with the heaviest stone blocks on Earth, including three weighing an incredible 1,100 tons each known as the Trilithon. Amazingly those colossal stone blocks were quarried about two miles away in the valley, where one such block, whose quarrying was not completed, still sticks out from the ground. The Greeks venerated the place since Alexander’s time as Heliopolis (City of the Sun god); the Romans built there the greatest temple to Zeus. The Byzantines converted it to a great church; the Muslims after them built there a mosque; and present-day Maronite Christians revere the place as a relic from the Time of the Giants. Most sacred and hallowed to this day has been the site that served as Mission Control Center--Ur-Shalem (“City of the Comprehensive God”), Jerusalem. There, as in Baalbek but on a reduced scale, a large stone platform rests on a rock and cut-stones foundation, including a massive western wall with three colossal stone blocks that weigh about six hundred tons each. Upon that preexisting platform the Temple to Yahweh was built by King Solomon, its Holy of Holies with the Ark of the Covenant resting upon a sacred rock above a subterranean chamber. The Romans, who built the greatest temple ever to Jupiter in Baalbek, also planned to build one to Jupiter in Jerusalem instead of the one to Yahweh. The Temple Mount is nowadays dominated by the Muslim-built Dome of the Rock; its gilded dome originally surmonted the Muslim shrine at Baalbek--evidence that the link between the two space-related sites has seldom been missed. In the trying times after the nuclear calamity, could Marduk’s Bab-Ili, his “Gateway of the gods,” substitute for the olden Bond Heaven-Earth sites? Could Marduk’s new Star Religion offer an answer to the perplexed masses? The ancient search for an answer has continued to our very own time. Zecharia Sitchin (1920-2010), an eminent Orientalist and biblical scholar, was born in Russia and grew up in Palestine, where he acquired a profound knowledge of modern and ancient Hebrew, other Semitic and European languages, the Old Testament, and the history and archaeology of the Near East. A graduate of the University of London with a degree in economic history, he worked as a journalist and editor in Israel for many years prior to undertaking his life’s work--The Earth Chronicles. One of the few scholars able to read the clay tablets and interpret ancient Sumerian and Akkadian, Sitchin based The Earth Chronicles series on the texts and pictorial evidence recorded by the ancient civilizations of the Near East. His books have been widely translated, reprinted in paperback editions, converted to Braille for the blind, and featured on radio and television programs.